For over 25 years Gutter Service Of Maine LLC owner Chad Johnson has been providing quality gutter services to both residential and commercial customers throughout Maine. With extensive experience in the roofing and rain removal industry, comes the integrity, knowledge, and experience required for success. Chad’s knowledge of roofing and rain removal systems is extensive and his enthusiasm for every job he takes is unmatched. His experience will bring you the best quality products backed by exceptional customer service and expertise. Chad’s reputation as an energetic, committed and seasoned professional ensures that the job will get done right every time. Long lasting relationships are established with our customers by consistently exceeding expectations. Gutter Service Of Maine LLC’s longevity is ensured through repeat and referral business achieved through customer satisfaction. With countless satisfied customers, Gutter Service Of Maine LLC offers quality products, superior customer service, and competitive rates. As well as having over 25 years of knowledge and experience, Gutter Service Of Maine LLC has the equipment necessary to manufacture and safely install rain gutters systems from basic to complex. Gutter Service Of Maine LLC has a well equipped sheet metal shop for custom fabrication of gutters and accessories, as well as the manufacture of metal flashing for home building and remodeling contractors. 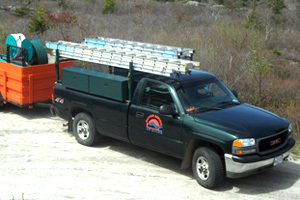 Gutter Service OF Maine LLC has the staging equipment necessary to safely install all gutter systems. Among the equipment are 24 ladders up to 48 feet long, 17 aluminum poles, 12 aluminum planks, metal pipe scaffolding, safety harnesses, and equipment trailers. “Safety First” is Gutter Service Of Maine LLC. Nothing is more important than the safety of customers, their homes, belongings and our employees. All employees receive training in the proper use of ladders, staging equipment, job site conduct, and customer relations. Employees will be respectful to customers at all times, keep a neat clean appearance, and leave the job site as it was found. Gutter Service Of Maine LLC is a no tobacco smoking company. All employees of Gutter Service Of Maine LLC receive a weekly payroll check and are covered with workers compensation insurance provided by Maine Employers Mutual Insurance Company. General liability insurance is provided by Peerless Insurance Company, commercial auto insurance by Travelers. Certificates of insurance are available upon request. Gutter Service Of Maine LLC is dedicated to providing it’s customers with prompt professional service and the highest quality rain gutter systems.